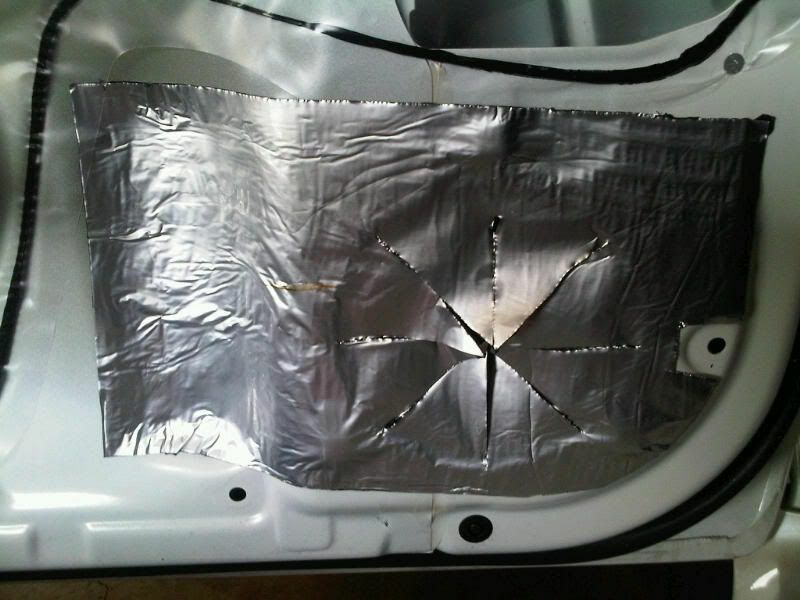 There is a lot on the forums about deadening. I’ll explain the very, very basics of it, but don’t want to get too much into specific brands or tactics. Sorry- you have to do your own research there. Try caraudio.com or diyma.com for good info. I followed the guides on http://www.sounddeadenershowdown.com/ in my earlier installs. That said, there are 2 primary methods for deadening sound- adding weight (mass loading) and blocking the sound (barrier membranes). The most effective strategy is to apply mass loaded deadener first, then to apply barrier membrane over that mass deadener and to use the barrier membrane to cover large openings in the inner door skin. I also STRONGLY recommend securing the edges of deadener (mass loaded or barrier membrane) with aluminized HVAC tape. One roll is far more than needed for an average installation, but it is designed to adhere to sheet metal (like HVAC ductwork) and to maintain its adhesion in changing temperatures, and in varying humidity conditions. It is a cheap way to provide extra security that the deadener won’t detach from the metal. No matter what method(s) you employ for noise control, the key to a good application is good surface adherence and a clean, dry, grease/oil-free surface to which it will be applied. I use Windex Vinegar as a cleaner, but you can get any good automotive degreaser to clean things up. I also try to wipe things down with alcohol (or even white vinegar) right before I apply the noise control. It is amazing what can be done with very little foam weatherstripping tape. Truck cap/camper top tape is also a good way to go for this. Mass loading is what most people think of when you say that you are doing sound damping or deadening in your car. Metal reverberates when the speakers move, when road noise causes vibrations, when you hit a bump, etc. The main area that vibrates is the inner door skin. That is the metal inner door that is covered by your door panel. Your outer door skin also has reverberations (primarily from road noise), but the inner skin is where your speaker is located, so it is responsible for holding still while the speaker moves (violently) within the plane of the inner door skin. Simple physics, but heavier the object the more energy that is needed to make it vibrate. Not only does it take more energy to make them vibrate, but when they do vibrate, it will be at a lower frequency (typically more difficult to hear). Mass deadener is your typical sticky, heavy material that is added to surfaces in your doors, floorboards, firewall, ceiling, hatch, etc. to control vibrations by adding weight (mass) to the surfaces. This is what the old-school dynamat is. It was the first widely-popular mass loading product for automotive deadening, but there are dozens of other products at all kinds of price points. You can get sheets, strips, mats, squares, rolls- all kinds of “flat” applications and products. Without good contact and adherence, mass deadener does not do much. It has to be attached to the surface to be effective. Applying these is usually best done with a clean surface (see above) and with the aid of a heat gun or hair dryer to help the material flex to make good contact with the surface. To get the material tight and to ensure that the adhesive makes good contact, small rollers (such as wallpaper rollers) are also a good idea. Below is an example of some mass deadener applied to the door of my past vehicle (will be updated with pics of WRX deadening, once completed). It is best laid in large sheets, but you also have to do your best to make maximum contact. Taping the top and sides with HVAC tape is a good idea. You will have to do the rap-and-tap method of determining where you need to add deadener (basically, tap or bang on the metal and see what reverberates the most. Add deadener, re-tap, repeat as needed). 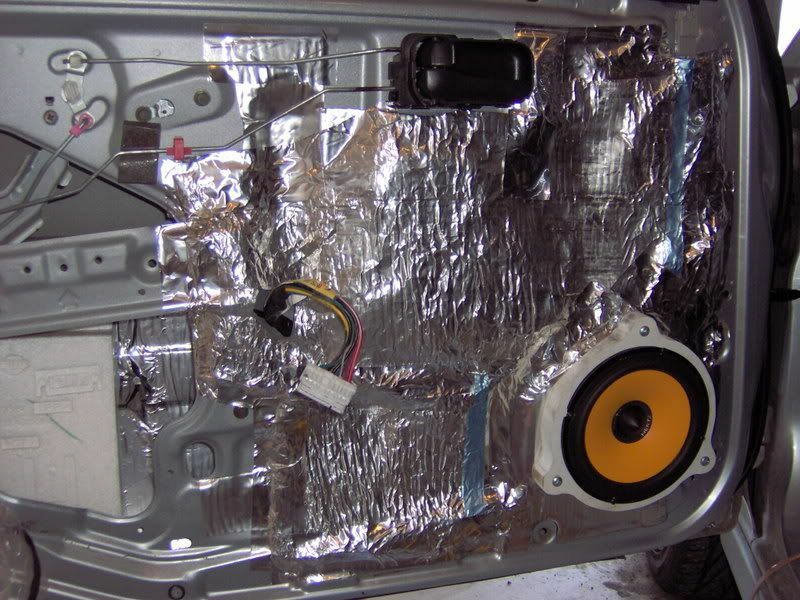 Popular places to add mass deadener are the inside of the outer door skin, particularly low on the outer door skin, and in the area immediately behind the speakers. On the inner door skin, the common place to use it is in the area near/around the speaker. Using it in this location also functions as somewhat of a gasket if you put it behind your spacer/adapter. Barrier membranes actually block sounds from transmitting into the vehicle cavity. Typically an adhesive-backed closed-cell foam or similar, these actually absorb sound waves, blocking their entry. Several companies make these products, so look around for a good price on the amount that you need. I actually went the el cheapo route with the material below (my only specific endorsement, since I have used it myself and have found it to be a good value that actually works). Here is a picture of barrier membrane applied to a past vehicle. I had not completed the sealing of the voids in the picture above, but you get the idea. Again, this will be replaced once I finish the WRX install. Barrier membrane is good not only for going over the mass loaded deadener do block sounds that make it past the mass loading, but is also great for covering large openings or voids. 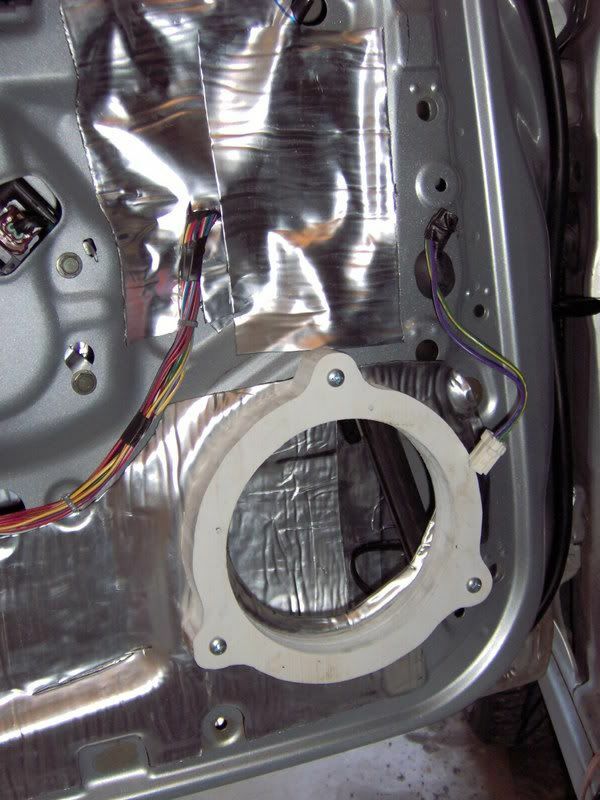 Without sealing off the big holes, sounds from the outer door skin are free to pass right through to the inner door panel. A really cheap option for covering large areas in the doors with a foam product is a self-adhesive foam roll product made by Frost King. It is (or was) about $12-15 at HD or Lowes, and has foam with a metallic outer coating. I have used it in the past as a barrier membrane. It can be applied to a clean metal surface and is best used in conjunction with the aluminized HVAC tape to promote permanent adhesion. The item number is FV516.